The Ultimate “Slow Death” Rig! The Slow Death tournament winning technique was developed during the 1990’s by several professional walleye anglers. Incredible natural action was added to their live bait presentations by using hooks bent in a specific fashion, threading a half a night crawler resulting in an irresistible corkscrew action, enticing even the most reluctant fish to strike. Attach a weight, and the year-round power finesse rig can be used for all species of fish. 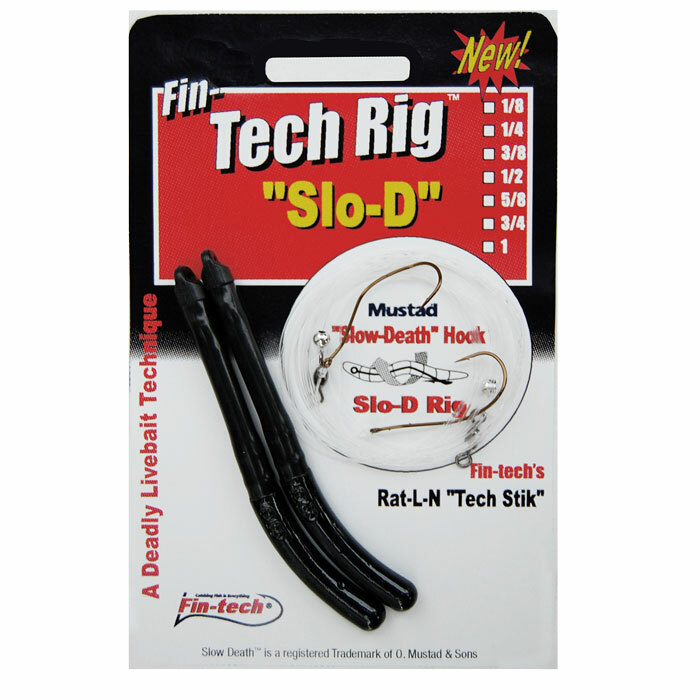 The Slo-D Fin-Tech Rig is a combination of the “EZ Weight Change” Tech Stik slip sinker and a Mustad “Slow-Death” hook tied on a Berkley Big-Game 10lb. test snell completes this ready to fish rig. The Fin-Tech Tech Stik is designed to be versatile on all bottom conditions. The tapered shoulder and curvature of the sinker allow it to slide snaglessly through just about any type of terrain. The buoyant rattle chamber sends out sound for fish to zero in on in colored/stained water. The small tapered eyelet prevents line twist and the ability to use the smallest of swivels. The new “EZ Weight Change” design allows you to change weights without retying – less rigging, more fishing! 1 oz., 1/2 oz., 1/4 oz., 1/8 oz., 3/4 oz., 3/8 oz., 5/8 oz.